Choosing a tour to Sri Lanka can be tricky, as it's larger than you might think. Read our top tips for relaxing, historic and cultural travel in Sri Lanka. 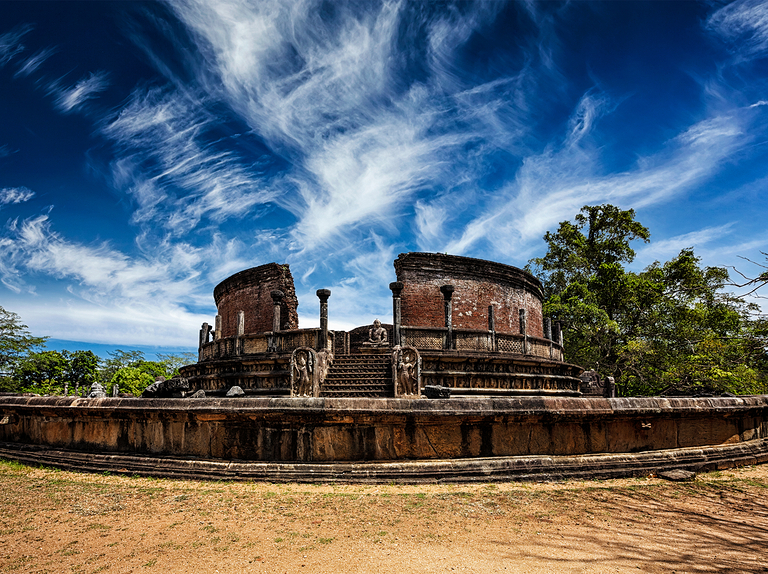 Walk through the UNESCO World Heritage Site of Polonnaruwa, a garden city built in the 12th century. If you have a question you'd like us to answer, you can write to us at Travel Surgery, Saga Magazine, Enbrook Park, Folkestone, Kent, CT20 3SE or email us. While we can't reply to readers individually, we will respond to queries in the Saga Magazine. India's neighbour Sri Lanka is a diverse and culturally rich country with exotic wildlife and some of the world’s most beautiful beaches, including Mirissa and Trincomalee. Since Sri Lanka is larger than you may imagine, deciding what kind of trip you’re after is important so that you can maximise your time away. Getting to grips with this fantastic destination is most easily done on a Sri Lankan tour - although the right hotel stay can also tick all the right holiday boxes. These tips should help you make the most of your Sri Lankan holiday, whether you're after history, culture, or good old-fashioned relaxation. Intricately woven through with myths and legend, gemstones and spice, the tropical island of Sri Lanka is guaranteed to captivate your imagination, as well as your senses. Find out more here. Try to find a Sri Lankan tour that takes in Colonial Ceylon and passes through Colombo, a city that was colonised by the Portuguese, then the Dutch and finally the British before regaining its independence in 1948. This city, with its naturally formed harbour, was a prized treasure among those who sought to stake their claim on Southeast Asia. Colombo has a distinctly Sri Lankan feel to it, and on your holidays you can wander through streets that have been crafted by many hands and still feel like you are in the beating heart of this Southeast Asian nation. Outside Colombo, explore the naturally beautiful attributes of Sri Lanka, and see where the modern meets the ancient by visiting Kandy and the famous Temple of the Tooth Relic, which is said to house one of Lord Buddha’s teeth. You can also learn about how the British colonialists started tea production in Sri Lanka on a plantation in Nuwara Eliya, and see how this beautiful part of the country functions today in a contemporary and independent climate. If you want to explore all the shades of Sri Lanka’s history and culture, then the Sri Lankan Adventure tour will take you to the western coast, and then up through the country to view the largest cave temple, Dambulla, which has been so well preserved it recently gained UNESCO World Heritage Site status. Stroll around Kandy’s Royal Palace and head out to the Pinnawala Elephant Orphanage for a day, where you can view these amazing animals up close. On this tour you will also touch on Sri Lanka’s colonial past, by walking through the rolling hills of the Ceylon tea estates, before heading into the wilds of the Yala National Park for the chance to spot leopards, macaques, water buffaloes, sea turtles and wild elephants. Head to the Hindu Shrines and Buddhist Temples nearby to step inside Sri Lanka's religious landscape. Take advantage of the famous Sri Lankan shoreline, and dip your feet in the warm Indian Ocean from the western side of the country at the Club Palm Bay Hotel. The waters that surround your resort hotel are blue and the coast is brimming with golden coloured sands and palm trees stretching along the beach as far as the eye can see. Choose an excursion to a local fishing village where you will have the opportunity to explore your surroundings and purchase local handicrafts, or travel to the Negombo Lagoon, where you board a boat for a mini-cruise along the Dutch Canal, one of a number of waterways built during the 18th century by the Dutch East India Company to facilitate their trade. If you’ve always wanted to travel to this beautiful, warm and long sought-after country, then contact Saga and we can help you choose a Sri Lanka holiday that will suit your interests and needs, with hotels included in the price. Venture east on your holidays where the weather is warm and the people even warmer and you could be sitting back at the beach or exploring National Parks, tea plantations and wildlife sanctuaries with Saga.